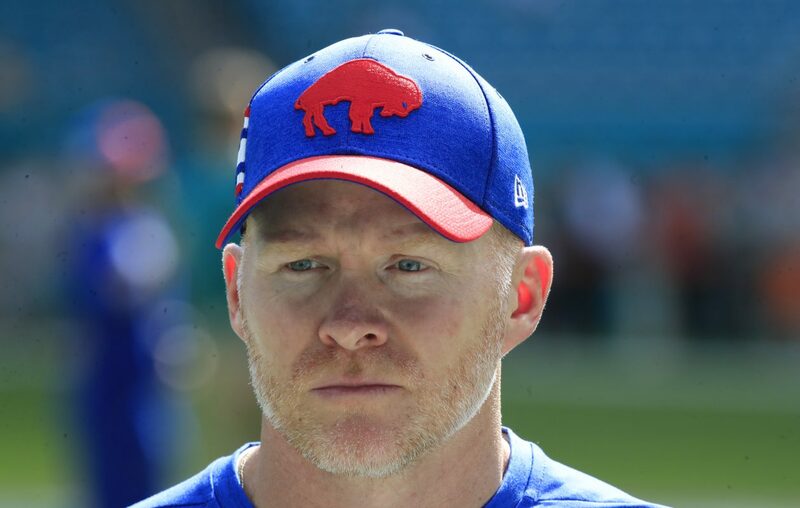 MOBILE, Ala. — More than anything, the recent changes Sean McDermott made to his coaching staff came down to a gut feeling about where the Buffalo Bills were headed after his second season as their head coach. It was the kind of thing, as he explained Tuesday, that literally poked him awake. McDermott concluded a shakeup was needed with the offensive line and special teams coaching spots, resulting in Bobby Johnson replacing Juan Castillo as O-line coach and Heath Farwell replacing Danny Crossman as special-teams coordinator. It also led to the dismissal of Terry Robiskie as wide receivers coach, although offensive assistant Chad Hall appears in line to be promoted as Robiskie’s replacement. Although McDermott said the Bills were “still going through the process” of finding a new receivers coach, he was quick to offer unsolicited praise for Hall, who has been on the staff since McDermott’s arrival in 2017. The firings of Castillo and Crossman took significant coaching experience from the Bills that Johnson and Farwell don’t replace. Johnson has only been an assistant offensive line coach in the NFL. It was a role he filled with the Indianapolis Colts in 2018 and in his first job in the league, with the Bills, in 2010 and 2011. McDermott also pointed out that Johnson is a student of the game. The head coach noted that in studying Johnson’s background, he was more than satisfied with the feedback he received. McDermott acknowledged the Bills took “a little bit of a leap of faith” with Farwell, given that he has only been an assistant special teams coach the past three seasons — last year with the Carolina Panthers and in 2016-17 with the Seattle Seahawks. Farwell is only five years removed from being a reserve linebacker and special teams standout for the Minnesota Vikings (2005-10) and Seahawks (2011-14). He was a Pro Bowl special-teamer with the Vikings and won a Super Bowl with Seattle. McDermott inherited Crossman, who had been on the staffs of the Bills’ previous two head coaches, Rex Ryan and Doug Marrone. After ranking among the best in the NFL under Crossman, the Bills’ special teams saw a sharp decline in 2018, especially in kick coverage. Meanwhile, the Panthers’ special teams held opponents to only 406 kickoff return yards last season, which was fourth in the league. In 2017, the Seahawks had 1,004 yards in kickoff returns and one return for a touchdown, good for second in the NFL. “I like the energy he brought to the interview, I like the thirst for knowledge and taking advantage of situations,” McDermott said of Farwell. “He’s been around some very good special teams units and coaches in his career. You watch what Heath did with (special teams coordinator) Chase Blackburn in Carolina. And so we did our research there as well and talked to a lot of people. It could have come from anywhere, it didn't have to be Carolina.